Houston — After lasting just 2 1/3 innings combined in his last two starts Carlos Silva (10-4) tossed five innings of one run baseball and won for just the second time in eight starts. Geovany Soto (who left after fouling a ball of his foot) started the double parade off Astros starter Wesley Wright (0-1) with a two run double in the 2nd. The Cubs hit five and all and never looked back. Alfonso Soriano added two of his own off Wright. Ryan Theriot (after a rough weekend at Wrigley) capped it off with his 1st home run on the season and his first in a major league high 700 at-bat drought. NL Player of the Week Aramis Ramirez continued his hot hitting adding two more hits. 2B – S Castro (17, W Wright); D Lee (19, W Wright); A Soriano 2 (24, W Wright 2); G Soto (15, W Wright). 3B – T Colvin (2, N Figueroa). HR – R Theriot (1, 6th inning off N Figueroa 0 on, 1 Out). 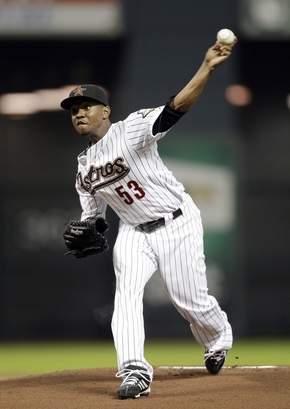 RBI – M Byrd (45), A Soriano (54), G Soto 2 (38), R Theriot (21). 2-out RBI – A Soriano. Runners left in scoring position, 2 out – T Colvin 1, S Castro 2, A Ramirez 1, G Soto 1. E – R Theriot (9, field). 2B – M Bourn (20, C Silva); H Pence (16, C Marmol). RBI – L Berkman (45), H Pence (49). 2-out RBI – H Pence. Runners left in scoring position, 2 out – M Bourn 1, L Berkman 1, C Lee 2, J Castro 1, W Wright 1. SB – M Bourn (31, 2nd base off C Silva/G Soto), C Johnson (2, 2nd base off C Silva/G Soto). DP – 1 (A Sanchez-J Keppinger-L Berkman). Pitches-strikes – J Berg 28-20; A Cashner 2-2; S Marshall 16-10; C Marmol 17-11; C Silva 90-54; W Wright 93-61; N Figueroa 40-25; G Chacin 7-6; W Lopez 14-8. Ground balls-fly balls – J Berg 6-1; A Cashner 1-0; S Marshall 1-1; C Marmol 1-1; C Silva 10-3; W Wright 6-6; N Figueroa 3-3; G Chacin 1-2; W Lopez 2-0. Batters faced – J Berg 10; A Cashner 1; S Marshall 5; C Marmol 4; C Silva 21; W Wright 24; N Figueroa 9; G Chacin 4; W Lopez 3. Umpires: HP–Brian Knight. 1B–Gerry Davis. 2B–Vic Carapazza. 3B–Greg Gibson.